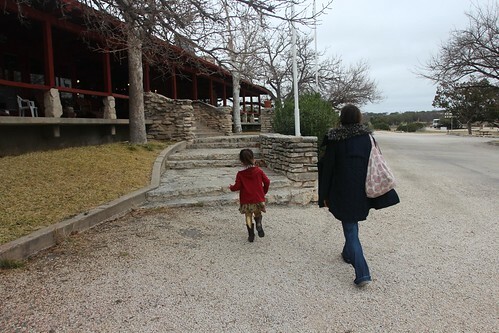 Mali Mish - Day 191: Caverns of Sonora and the Texas Highway Patrol. When we got here last night, the rest stop was completely full. In fact, a couple of big rigs decided to just stop in the middle of the road while they took a break so the rest of us were stuck and it nearly backed up onto the freeway. This morning, it was overcast and quiet. Most of the trucks and RVs have left as we started to make our way out. Sonora, Texas is one of the small towns off of the freeway in west Texas. West Texas is one of the most grueling stretches of road to drive through along I-10 during a cross country trek. It’s not because the road is bad or particularly difficult to drive on. In fact, the road is very nicely maintained and easy to navigate. The tough part is how much of it there is. Between El Paso and San Antonio, there are nearly 600 miles of road with nothing much to see. When we were here last time, we spent a night at their campground. It has water and electric and price is very reasonable. We did the cave tour last time so we are just here for a quick visit before moving on to our next stop later today. 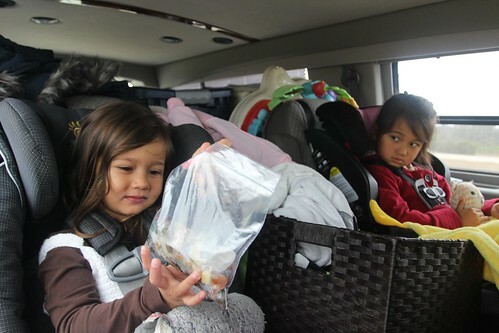 Our friends Claire and Daniel whom we met in Tucson in 2010 were on a 1-year road trip across the US with their girls Sophia and Lulu. 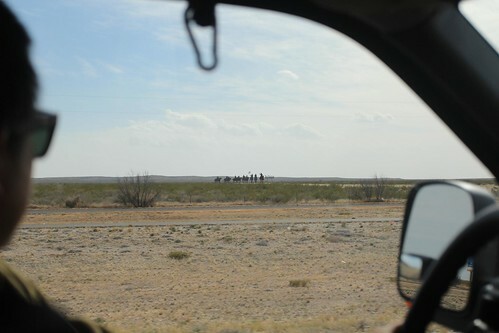 We caravanned with them through Arizona, New Mexico and Texas during our last trip. 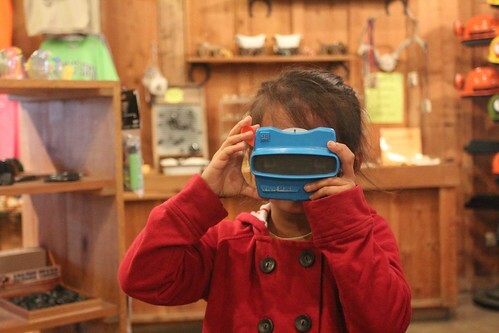 Sonora, Texas was one of the stops we made with them and Ava remembers vividly doing the cave tour and panning for treasures with Sophia. We have since met many other Airstreaming families but the memories of traveling with them will always hold a special place in our hearts. 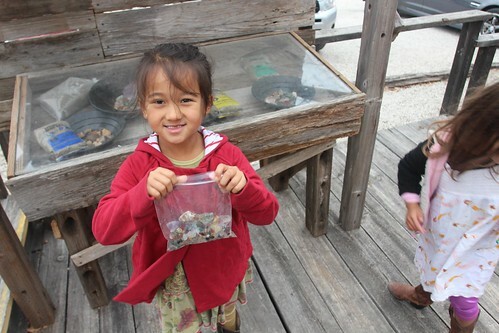 Marlene also remembered the treasure panning experience quite well. 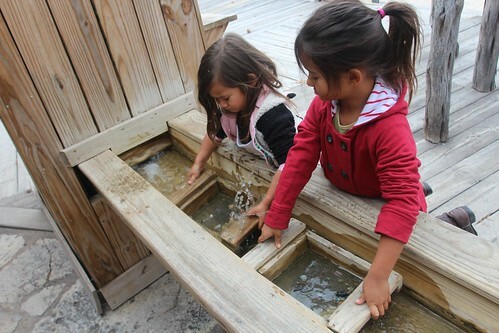 Being an inexperienced prospector, she dumped the bag of sand directly into the trough rather than into the sifting box. She promised to Ava that one day we will come back and do it again and do it right. That day is today. 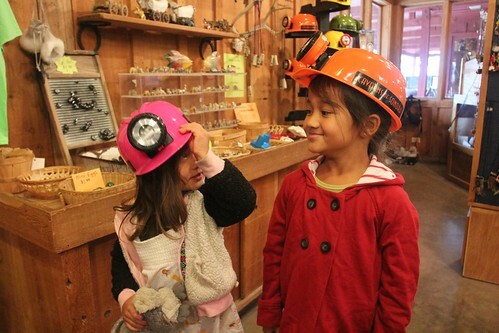 Ava and Mila panned for treasures like champs and did not let a simple gem stone slip by their prospecting hands. Clearly, we are not the only Airstreamers that have enjoyed a stop here at the caverns. 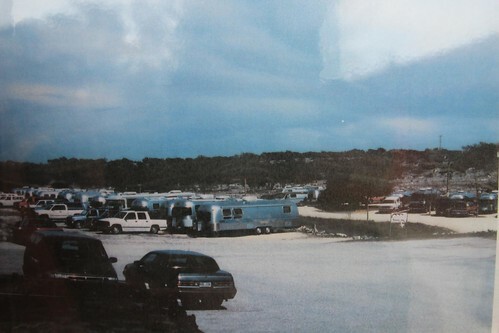 This is a photo on display of an Airstream rally that was held here. Even though there are only a handful of hookup sites, there is plenty of space to accommodate lots of us. 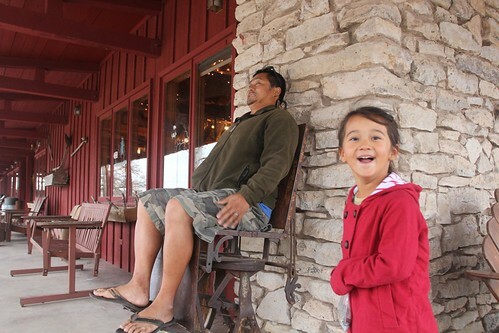 The front porch of the gift shop shares a striking resemblance to a Cracker Barrel. But this strange looking antique dentist’s chair feels more like a medieval torture device than a rocking chair. Our brief stop lasted just about an hour before we got back on the road to start heading towards our next destination. 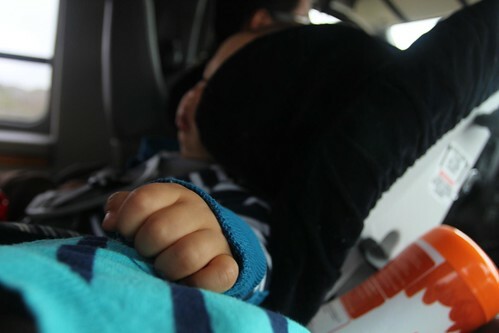 This is Luka who can not help himself but to grab a handful of Marlene even when he soundly sleeps in the car seat. Unlike last time, Mila was merely 6 months old when we visited Sonora. 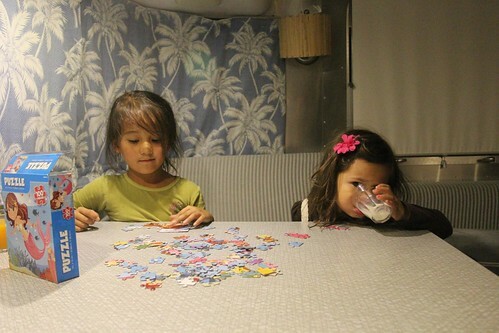 Ava now has to share all of her treasures with her little sister. As we headed across west Texas, our goal for the evening is to make our way towards Marfa, Texas where we plan to stay a few nights at El Cosmico. 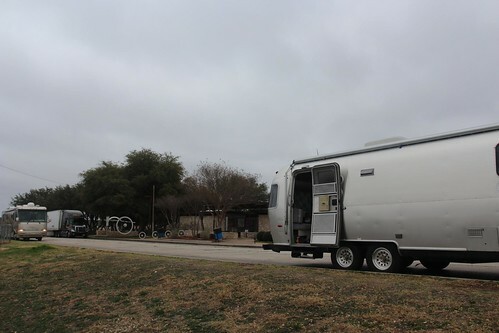 I scoped out another Texas roadside rest stop and started to make our way there. We got to our destination late in the evening and the winds were blowing wildly across the plains. The rest stop called Point of Rocks Roadside Park turned out to be in the middle of nowhere which is a little unnerving to set camp in the dark. There were no street lights nor are there any other campers there. As there are no other options for at least 30 miles, we found a nice level spot and dropped anchor. This is where things started to go a little sideways. We made a late dinner and as the girls were eating around 9pm, we got a knock on the door. That is never a good sign especially since we did not see a single person the entire way. We looked out and noticed that it was the sheriff. The sheriff was an older gentleman and he turned out to be quite nice and friendly. He had gotten a call from Border Patrol saying that someone had broken down along the side of the road. He was just checking to make sure that it wasn’t us. We asked him to confirm that it was OK for us to stay the night here and he reassured us that there was not a problem at all. We cordially bid each other good night and he went on his way. Having had a positive experience with local law enforcement made us feel a little more comfortable as now we know that there is someone looking out for us. That is until we got another knock on the door at 2am. This time, we were even less thrilled to be confronted with whoever might be outside. It was cold, wind was howling and since we had already spoken with the sheriff, we did not know what to expect. After a few rounds of knocking, we heard a couple of guys outside saying that they were state troopers of the Texas Highway Patrol. Apparently, Texas Highway Patrol do not talk to the sheriff. These two officers are probably new on the force as they seem to be in their 20’s. Clearly they have not learned the idea of ‘Protect and Serve’ and have rather taken on the motto of ‘Harass and Intimidate’. They came across extremely rude and obnoxious as they asked what we were doing there. I thought it was pretty obvious what we were doing there. Especially since we were wearing pajamas and the kids were sleeping in the pullout couch bed right near the door. One of the officers snarkly said, “I guess you don’t know what happens at these rest stops.” I thought to myself, ‘What the hell is he talking about?’. I handed him my driver’s license as he asked me to step out of the trailer and stand next to him by the patrol car while he ran my license. OK, it was probably 30 degrees out with 25 MPH winds that brought the temperature down to near the teens. I am wearing a t-shirt, shorts and a thin fleece jacket. I was not ready to deal with this ( believe me, I’ve already started in my mind calling the UK driver’s center and explain this situations) at all at 2AM but there was little choice they were giving me. I told Marlene I was stepping outside for a minute so the cold winds did not continue to blow inside the trailer waking the kids up. I stood next to the patrol car in subfreezing temperatures while the snarky cop ran my license. I asked the other guy what his partner was talking about what goes on here. He told me that they have found backpackers in the past at the rest stops using illegal drugs and were given a the kit that women should use when testing drugs. ‘Really?’ I thought to myself. ‘That is what this douche bag was referring to?’ I thought it was something more serious like we were in the territory of a murderous drug cartel. Backpackers doing drugs. That was what we were suspected of doing. After what felt like an hour of standing out there in the cold, my license of course returned no warrants nor criminal records. I got back in the Airstream shivering and with my teeth chattering. I hope that I will never again have to deal with Texas Highway Patrol as long as I live. Even if that means never again stepping foot in Texas. In some conversations with other traveling friends, I have heard others who had similar encounters with the Highway Patrol here. A friend was once asked to remove every piece of belonging out of their car during a road trip onto the side of the road during a routine traffic stop. When they found nothing suspicious, they simply drove away leaving them to repack all of their stuff. This was by far the worst law enforcement encounter we have ever come across. This made our speed trap experience in Florida feel like a walk in the park. I hope the Texas Highway Patrol is happy for having taken over the throne of King of Douche Bags in all of our cross country travels. 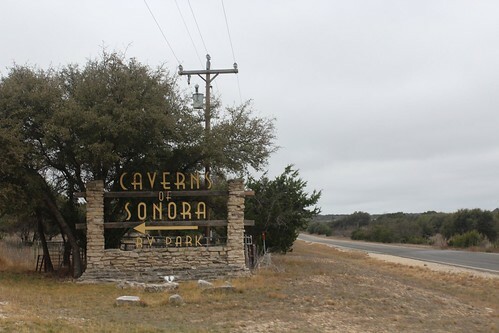 3 Responses to Day 191: Caverns of Sonora and the Texas Highway Patrol. So sorry to hear about your bad experience. Sounds like they are real bored in Texas and have nothing better to do than harass a lovely family such as yours. Geez! We had a similar experience, the only one of its kind we’ve EVER had, and not too far from where you’re at. We were down near Big Bend National Park. At the time, we traveled in an old 1978 VW Bus. It literally had a top speed of 66mph. We passed a state trooper parked on the side of the road, at the bottom of a steep hill–an obvious way to trap folks who might pick up a little speed on their way downhill. I checked the speedometer and we were doing 55mph. So we began climbing the hill in front of us, which put us down at around 45mph. The police car came up behind us and threw on his lights. Now I understand that we’re driving around an old hippy van. I believe they call it “profiling” but whatever. What ensued was the officer yelling from the back of our vehicle for me to get out of the car, before ever approaching us or signaling why he’d pulled us over. I get out, he puts me in cuffs, ends up with Renee breaking down crying and Tristan–who was 9 at the time–left standing on the side of the road in the middle of the desert wondering what was going on. The officer thought we were trafficking drugs across the border I guess. At first I told him he had no right to search our vehicle, but he made it pretty clear that all three of us would be going to the station if we didn’t comply. I agreed, he found nothing, and gave me a paraphernalia charge for some rolling papers (we both smoked cigarettes at the time, the papers were inside of a bag of American Spirit tobacco). No speeding ticket mind you. I ended up paying the fine, which I guess leaves me with some type of drug related charge on my record, as I had no desire to go to a court in the middle of nowhere and be at the mercy of some good ol’ boy judge. After giving me the ticket, he then proceeded to tell me how border patrol would likely tear our vehicle apart if we tried to head north. I’ve spent tons and tons of time in West Texas, no border patrol has ever given us any trouble. Just this one Texas State Trooper who felt it was his job to humiliate us in front of one another, and then what? Was he trying to get us to live in WTX forever with his border patrol comment? Locals in Terlingua and Marathon had warned us about this, they said it was commonplace and was having a significant effect on tourism in the area as local and state cops had begun pulling people over, for no valid reason, and doling out fines more and more regularly. A few months later we were pulled over, in a rental car, some type of a brand new Kia, just outside of Alpine for going 2mph over the speed limit. That particular officer wasn’t overly rude or anything, and admitted that 2mph was not very much over the limit. He mentioned that “you were increasing in speed, which is why I pulled you over.” Which I took to mean, we WERE doing the speed limit when he first clocked us but got all the way up to 57mph which, yeah, that’s a big red flag. We’ve never been pulled over anywhere else, ever during our travels since or before then. So sad to hear this kind of illegal nonsense is still going on. Nathan, what they did to you is ridiculous and totally illegal. I don’t know if there are anything we can do about it but maybe telling our stories online will help others to be more aware of the rogue attitude the entire department seems to have out there. Thanks for sharing your experience.